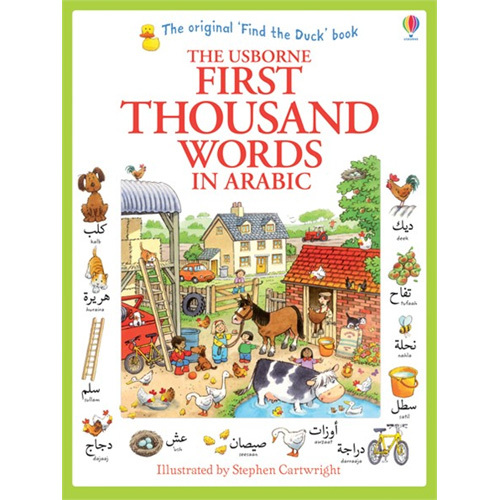 The Usborne First Thousand Words in Arabic serves as a comprehensive illustrated vocabulary-builder, teaching 1000 new Arabic words. Panoramic pictures of everyday scenes are surrounded by small pictures with their names in Arabic. Each Arabic word is also written in Roman letters to show you how to pronounce it. At the back of the book there is a guide to the Arabic alphabet and a list of all the Arabic words with their pronunciation guides and meanings in English. The Usborne First Thousand Words in Arabic is suitable for children of all abilities, even complete beginners. The easy-to-use pronunciation guide will help parents having no previous knowledge of Arabic to enjoy using this book with their child.